New Delhi: Andhra Pradesh Chief Minister N Chandrababu Naidu along with TDP MPs and MLAs met President Ramnath Kovind at Rashtrapati Bhavan here on Tuesday and raised demand for special status for the state. “For the development of Hyderabad there has been a struggle for 60 years and today it stands as a world-class city. 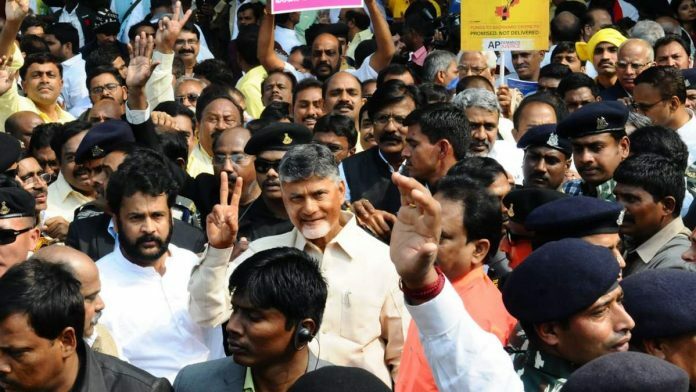 On seeing the injustice done to Andhra Pradesh many people went into depression and recently a physically challenged man Arjun Rao has committed suicide over the special status not being granted to the state,” Naidu said at a press conference. He said that a possibility of pre poll alliance with opposition parties cannot be ruled out.